Just Like Us tells the story of four high school students whose parents entered this country illegally from Mexico. All four of the girls have grown up in the United States, and all four want to live the American dream, but only two have documents. As the girls attempt to make it into college, they discover that only the legal pair see a clear path forward. 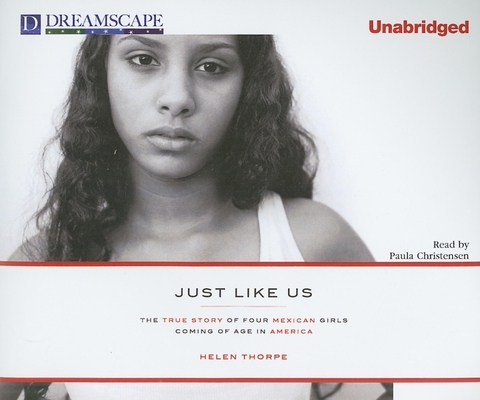 A coming-of-age story about girlhood and friendship, as well as the resilience required to transcend poverty, Just Like Us is also a book about identity. The girls, their families, and the critics who object to their presence allow the reader to watch one of the most complicated social issues of our times unfurl in a major American city. Helen Thorpe was born in London, England, and grew up in Medford, New Jersey. Her journalism has appeared in The New York Times Magazine, New York Magazine, Texas Monthly, and The Texas Observer. Theorpe has worked for The New York Observer, where she wrote the Talk of the Town stories; and Texas Monthly. She is married to John Hickenlooper, who was recently elected Governor of Colorado. Just Like Us is her first book.READERBIOPaula Christensen was born in Buenos Aires, nursed in Chicago, raised in New York, and attended a fancy liberal arts college in Massachusetts before finally settling in Los Angeles. She has appeared onstage throughout Los Angeles, with several television appearances. Look for her in the upcoming feature Open House starring Anna Paquin, and on the improvised web series Caffe Etc."